AddressThe address for this sale in Evanston, IL 60202 will no longer be shown since it has already ended. Cash Only. Bring Help to Carry/Load Large Items. Not responsible for accidents. No returns. Dark wood side table. 2'8" wide x 10 1/2" deep x 2'6" tall. Good condition. Not heavy. Gold damask table runner also for sale. Village Hall light not for sale. The large jug is SOLD. 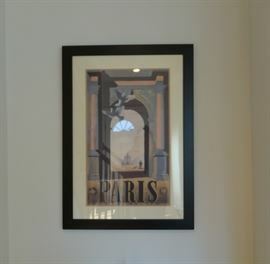 Framed neutral tone poster of Paris Arc du Triomphe, glass, black frame. SOLD. 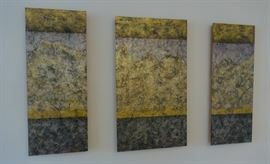 Original oil painting “Time and Movement- Etched in Stone” triptych framed by the prolific Wisconsin artist, Mark Pflughoeft, 2006. $1,200. Colors are golds, charcoal, purple, silver. Excellent cond. Signed. Signature of the artist, Mark Pflughoeft. Artist Proof Photograph of a Parisian store front. 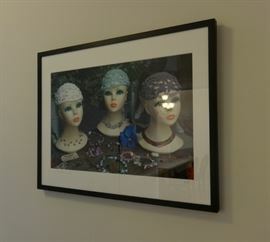 Framed in black w/glass. Signed by the artist, Paul Wasserman, Chicago. 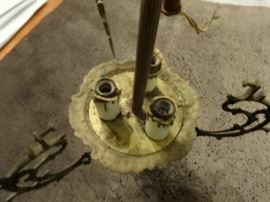 Antique Brass Light Fixture w/3 Candles. Size: 19" tall by 10" wide. Needs a glass shade. 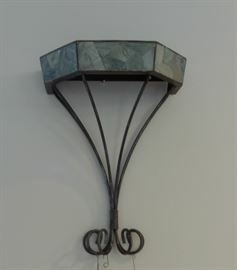 Abstract, modern metal wall hanging, made to resemble stained glass. Colors: blue, greens, charcoal. Does not contain a light. Excellent cond. 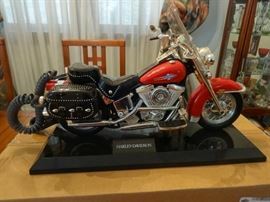 Jumbo authentic Harley Davidson Heritage Softail Motorcycle Telephone - works well! Size 15" long & 10" tall. Vintage maple wood table base measures 2'5" tall x 1'3" in diameter, very sturdy. Available with or without the granite top sold separately. Not attached. Also, wooden rooster folkworks style. 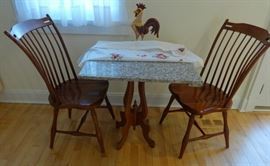 2 very high quality cherry chairs from Shaker Traditions, Evanston. Granite top measures 2'4" x 2'3" - it is not attached to the base. Cut glass modern lamp is for sale, also. Stained glass peacock window decoration on a chain. Excellent condition. Oil painting of Paris - Arc du Triomphe. Very good cond. No glass. Turkish handmade dyed goat skin floor lamp, in reds and golds & black; areas of the skin are split (torn) from the heat of the lamp. Unavoidable. Still beautiful. Baker Furniture Co. Upholstered wing chair. Extremely comfortable. Needs to be re-upholstered. Size is 3'4" tall at the back x 3' wide x 2'5" deep. Purchased from Marshall Field's back in the day. Label under the seat of the red upholstered chair. 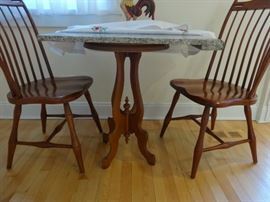 Vintage dining room chairs, set of 4, one has a missing wood piece. 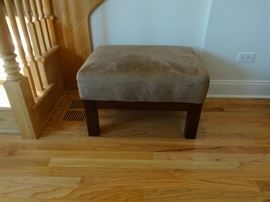 Size: 1'8" wide x 1'7" deep x 1'7" high at the seat. Upholstery is in good shape. Dark wood dining room table, the side ends fold down. One 10" leaf is included. 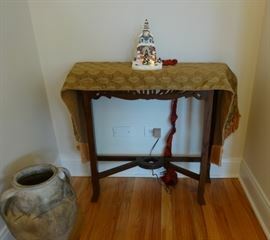 Size of table is 5' 6" long x 3'4" wide x 2'6" tall. One of the brass "feet" end is missing. Antique desk, dark brown with leather inlay top. Pretty good shape. Size: 3'7" wide x 1'10" deep x 2'6" high. Upholstered chair with "Oasis" theme of palm trees and camels. Size: 2'11" tall at the back x 1'10" wide x 2' deep. Very good condition. Golds, browns, greens. Two living room side chairs, dark wood, and cream cushions. Could stand to be reupholstered. Size: 1'10" wide x 1'7" deep x 2'10" tall at the top. Pretty good condition. Concrete Decorative Lion's Head Mantel Piece or Wall Hanging. Heavy. Glass top coffee table bordered in brass, top lifts off of the brass base. Size: 3'2" diameter x 1'6" tall. Glass is heavy, base is not. Oriental rug, very good condition needs cleaning. Size: 8'10" x 12'9" including fringe. I think it is silk. No pad. Large black leather living or family room sofa; extremely comfortable to sit or sleep on. Size: 7 1/2' long x 3' tall x 3'2" deep. Heavy, heavy piece. Good condition. Some pet claw marks, but no rips. 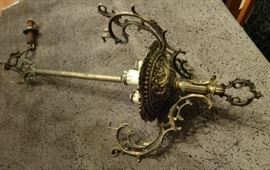 Antique brass & glass torchiere/floor lamp. Heavy. Glass is in good shape. Metal has patina of the years. Water color - black frame & glass. Unique framed exotic sea shell. easy to remove from case. Dirt Devil bag-less upright vacuum cleaner, works well. Metal and glass shelves bathroom towel rack. Size: 5'1" tall x 9" deep x 2'2" wide. Very good condition, could use a cleaning. Super-sized off-season wardrobe clothes rack, zippered case. Good condition. Size: 5'1" wide x 1'8" deep x 5'5" tall. Very basic wooden 5-shelf bookcase without a back. Size: 2' wide x 10" deep x 5'8" tall. Good condition. Nice quality rug in cranberry color. Antique Cast Iron Ball and claw feet for old bathtub. The front feet measure 6 3/4" tall by 6 1/4" at the widest, while the rear feet (taller so the bathtub will drain) are 7 1/8" tall by 4 3/4" at the widest. Glass top Metal Outdoor Table w/hole for umbrella & 2 chairs.